At one time the Buddha dwelt at the city of Shravasti in the sublime abode of the Jeta Grove. With a gathering of great bhikshus, twelve hundred fifty in all. 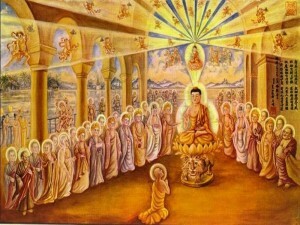 All were great Arhats without outflows, disciples of the Buddha, dwellers and maintainers. They had fully transcended all existence, and were able to travel everywhere, and to accomplish the awesome deportment. They followed the Buddha in turning the wheel and were wonderfully worthy of the bequest. Stern and pure in the Vinaya, they were great exemplars in the three realms. Their limitless response-bodies took living beings across and liberated them, pulling out and rescuing those of the future so they could transcend all the bonds of dust. The names of the leaders were: the greatly wise Shariputra, Mahamaudgalyayana, Mahakaushthila, Purnamaitreyaniputra, Subhuti, Upanishad, and others. 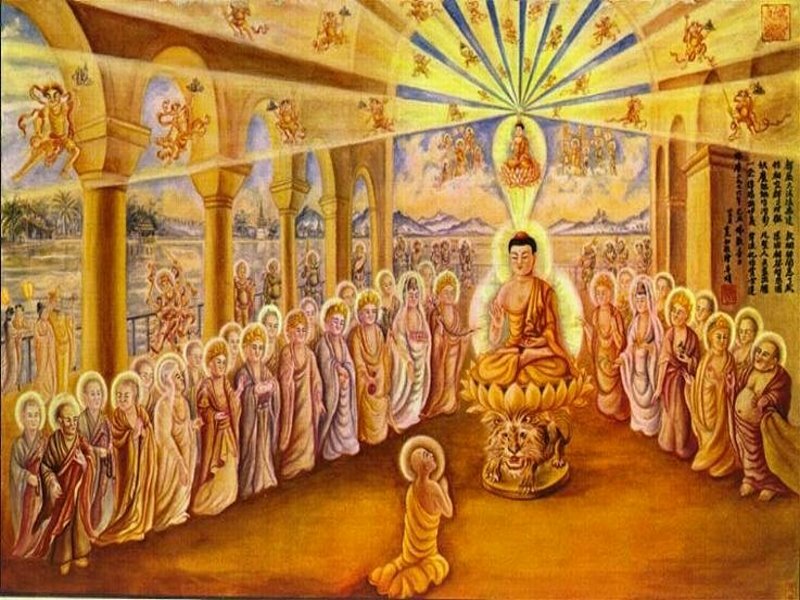 Moreover limitless Pratyekas who were beyond study and those with initial resolve came to where the Buddha was to join the bhikshus’ Pravarana at the close of the summer retreat. Bodhisattvas from the ten directions who desired counsel in order to resolve the doubts in their minds were respectful and obedient to the Awesome but Compassionate One as they prepared to seek the Secret Meaning. Then the Tathagata arranged his seat, sat quietly and peacefully, and for the sake of everyone in the assembly proclaimed the profound and mysterious. Those in the pure assembly at the banquet of Dharma obtained what they had never obtained before. The Immortal’s kalavinka-sound pervaded the ten directions and Bodhisattvas as numerous as the sands of the Ganges gathered at the Bodhimanda with Manjushri as their leader. Unfortunately there are few translations of this Sutra since the original Sanskrit is in limbo somewhere; what we do have are renditions by the renowned Venerable Dharma-Master Hsuan Hua and also another by Charles Luk. My main resource is the 2002 edition of the Buddhist Text Translation Society’s rendering by Hsuan Hua and his invaluable commentary. There is a more recent adaptation from 2009, but I prefer the former since I sense that a lot of the mystical nuance was jettisoned in favor of a more colloquial attempt with the latter. This present series will hopefully enhance Hsuan Hua’s marvelously spiritually-insightful presentation in Light of the Unborn. The present assembly is roughly the same, one that consisted of advanced Maha-Bodhisattvas and monks who were in advanced stages of Tathatic development. This was the “annual summer retreat” that the Tathagata shared with his finely-attuned adepts of the Buddhadharma. The “Great” Arhats are those who have traversed all the stages of the lower bhumis and are now entering into the ten-fold path of the Bodhisattvas. They have effectively transcended the effects of any outflows from the phenomenal realm; hence they are beyond the three realms of desire, form, as well as the formless realms. They are no longer influenced by the karmadhatu and are now “dwellers in the Realm of Dharmadhatu”. Their whole being is now exclusively devoted to the Buddhadharma; their manomakaya bodies are able to transport to and fro through sundry Buddhafields and in so doing are quite capable of displaying the “awesome deportment”, or the Great Bearing of Noble Wisdom. Their whole demeanor radiated the Noble Stature of their Mission in turning the Dharma-wheel of the Tathagata. As “turners of the wheel” they were able to transport and liberate many sentient beings who were entrapped in the lower regions of the unwholesome. In this heightened sense there were true and authentic “Dharma-beings” and could thus shake any defiling dust from their feet, since those self-same feet are blessed with the markless-mark of the Tathagatas themselves. Many illustrious Dharma-beings were among them, most eminent being the Great Maha-Bodhisattva Manjushri himself. They were all about to obtain what they had never obtained before as they began to listen ever so attentively upon the blessed words, sounding like the unsurpassed sweetness of the kalavinka (song-bird), that were about to descend upon them from the revered tongue of the Tathagata. The gift of the Buddhadharma is the highest. This entry was posted in The Śūrańgama Sūtra and tagged Arhats, Buddhadharma, Dharma-beings, turners of the Dharma-Wheel. Bookmark the permalink.